If you are an app designer, you probably get bombarded with new ideas constantly, most of which never see the light of day. Of course, you cannot possibly test all of them, but it can be useful to have access to a tool that allows you to experiment with various concepts and interface designs. Principle is an intuitive macOS app created for this particular purpose. 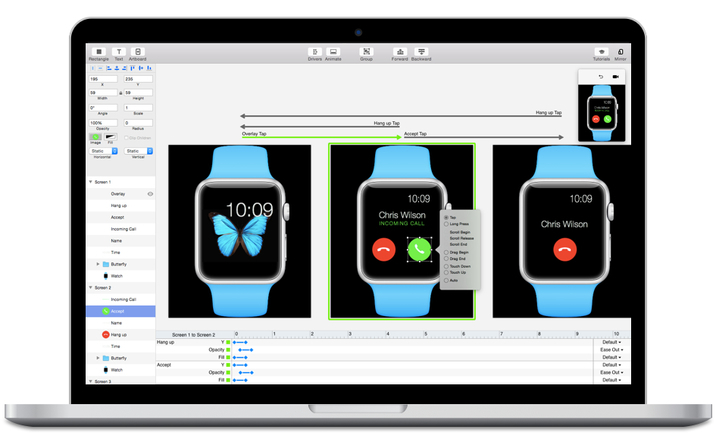 It can help you generate animated, interactive designs, with customizable layouts and transitions. The results can be recorded and shared with others or viewed directly on your mobile device. Your project is split into multiple artboards, each containing a certain number of layers. You can import image files and insert customizable objects or text items. Interactions are handled with the use of drivers and animations, all of which are displayed in an accessible timeline view, making it simple to alter their properties and get an overall idea of the state of your project. You can get an idea of what the finished app would look like and interact with your design at any time. Of course, you will definitely want to show the end result to others, and Principle provides a simple way to do that. You can record any actions performed in the preview window and export the captured content to QuickTime MOV videos or GIF animations. When you are designing a new app, any distractions can reduce your productivity and prevent you from staying focused on your project. Principle displays only the functions that are absolutely necessary in the main window, dedicating as much space as possible to the canvas where your designs are placed. If you are not using a tabled or trackpad, navigating through the various artbooks may be more difficult, but it is made easier with the many keyboard shortcuts detailed on the developer's homepage. All in all, Principle is a simple utility that can be very useful for app creators, as it provides a relatively straightforward method of setting up and recording interactive interface designs.